This Joint Meeting has the objective to amalgamate the efforts of three long-standing initiatives in order to concentrate in a single meeting the updated information on different topics in the fields of general thoracic surgery and thoracic oncology. The scientific programme will combine a series of short lectures with video forum sessions, and live surgery interventions performed by well-known specialists. The scientific programme will be designed to meet the needs of residents as well as young and senior specialists in thoracic surgery, pulmonology, and oncology. D. Mathisen, R. Landreneau, P. Pairolero, S. Hazelrigg, S. Cassivi, D. Lardinois, A. Patterson, D. Nuss, I. Vogt Moykopf, A. Lerut, E. Rendina, K. Naunheim, M.R. Mueller and others) with a valuable contribution of the Spanish units in each of the meetings. In July 2005 the regular meeting was replaced by the organization of the 11th World Conference on Lung Cancer in Barcelona with the participation of 5,000 doctors from 92 countries. Topics are carefully selected and are usually an up to date with the help of video and/or live surgery, with enough time for discussion with the audience. lymphadenectomies, and trascervical extended mediastinal lymphadenecto-The International Workshops on Surgical Exploration of the Mediastinum and Systematic Nodal Dissection have been organized in Terrassa, Barcelona, Spain, in 1998, 2000, 2003 and 2006. Nearly 100 speakers from Spain and abroad have participated in these highly specific meetings. Their highlights have been the live surgery programmes featuring systematic nodal dissection and lung resection for lung cancer performed by Japanese thoracic surgeons (T. Naruke, R. Tsuchiya, T. Goya, H. Kondo, H. Nomori, and H. Asamura), and videomediastinoscopies, extended cervical videomediastinoscopies, video-assisted mediastinalmies, performed by staff thoracic sugeons and invited thoracic surgeons who developed these techniques (M. Huertgen, B. Witte, M. Zielinski, and J. Kuzdzal). Additionally, topics such as transbronchial needle aspiration and bronchial and oesophageal ultrasound with fine needle aspiration have been integrated into the programme due to its clinical relevance and utility. The Bronchogenic Carcinoma Cooperative Group of the Spanish Society of Pneumology and Thoracic Surgery (GCCB-S) registered data from nearly 3000 patients with lung cancer who had undergone surgical treatment from 1993 to 1997. From the analyses of the collected data, some 30 publications in indexed journals have been already published, and numerous lectures and presentations have been contributed to national and international meetings around the world. This multicentre project is still active, and the clinical data are being now complemented with molecular information from the surgical specimens in cooperation with the Spanish National Cancer Research Center in Madrid, Spain. 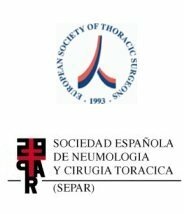 The GCCB-S has organized two symposia in Spain: in Valladolid, in 1998, and in Madrid, in 1999 (Lung Cancer 2000; 29: 79-83). In these symposia, members of the GCCB-S presented preliminary results from the Group’s data, which were complemented by presentations from an international faculty including C. Mountain, T. Naruke, R. Tsuchiya, R. Ginsberg, G. Motta, H. Bülzebruck, C. Wittekind, and A.R. Feinstein.